From barbecues to picnics, your family is going to absolutely love this Instant Pot corn on the cob! One of my favorite parts of this Instant Pot corn on the cop recipe is the butter! What’s corn on the cob without melted butter and just a touch of salt!? Plus it’s so much easier than traditional corn on the cob! With literally no prep time, you can get perfect pressure cooker corn on the cob in no time! 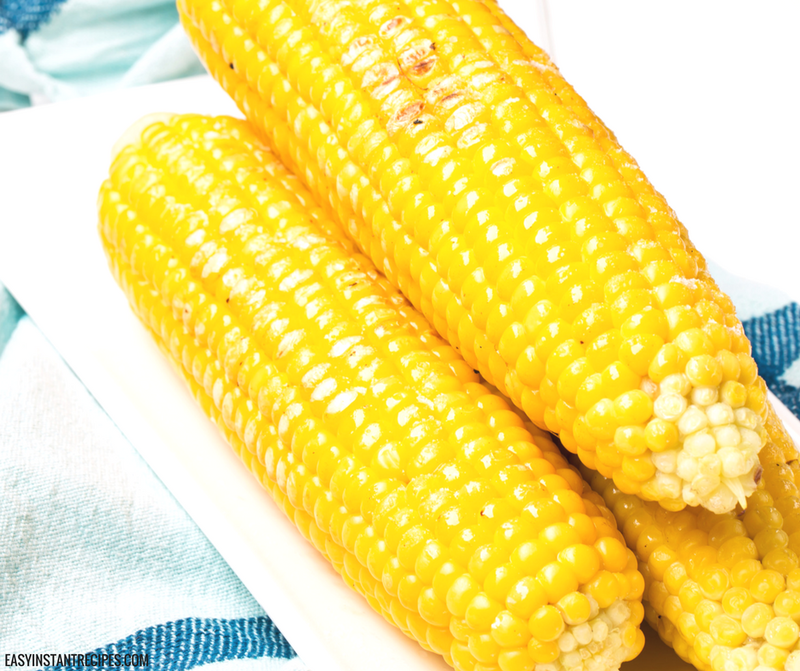 Pair this corn on the cob with burgers and hotdogs, or steak and potatoes. Whatever your favorite summer dish, this Instant Pot corn on the cob is going to be a perfect pairing! So add some flavor to your next barbecue, picnic, or really any dinner this summer with this super simple Instant Pot corn on the cob! This super easy Instant Pot corn on the cob recipe takes less than five minutes total, so there is nothing keeping you from making this every night this summer! These are some of our very favorite items that make this recipe even easier to make! I just know that your family will love this electric pressure cooker corn on the cob as much as mine does! And you’ll love how quick and fast you’ll have delicious Instant Pot corn on the cob ready! Pour the water in the Instant Pot. Place the trivet in the Instant Pot, and top with your steamer basket. Lay the sweet corn in the steamer basket. Cover pot, lock the lid, and seal the vent. Set the pot to "Manual/High" for 3 minutes. Once the pot beeps, quick release the pressure and serve! If you’re not making this Instant Pot corn on the cob right this second, make sure you pin this recipe to save it for later!